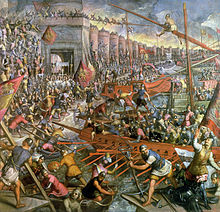 With the mutual excommunications of the East–West Schism in 1054, the churches in Rome and Constantinople each viewed the other as having departed from the true Church, leaving a smaller but still-catholic church in place. Each retained the "Catholic" part of its title, the "Roman Catholic Church" (or Catholic Church) on the one hand, and the "Orthodox Catholic Church" on the other, each of which was defined in terms of inter-communion with either Rome or Constantinople. While the Eastern Orthodox Church recognises what it shares in common with other churches, including the Catholic Church, it sees catholicity in terms of complete union in communion and faith, with the Church throughout all time, and the sharing remains incomplete when not shared fully. 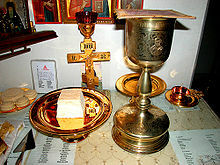 The Eastern Orthodox communion is organised into several regional churches, which are either autocephalous ("self-headed") or lower ranking autonomous (the Greek term for "self-lawed") church bodies unified in theology and worship. 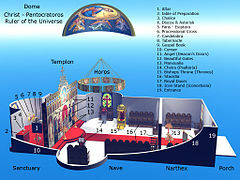 These include the fourteen autocephalous churches of Constantinople, Alexandria, Antioch, Jerusalem, Georgia, Cyprus, Bulgaria, Serbia, Russia, Greece, Poland, Romania, Albania, and the Czech Republic and Slovakia, which were officially invited to the Pan-Orthodox Council of 2016,, the Orthodox Church in America formed in 1970, the autocephalous Orthodox Church of Ukraine created in 2019, as well as a number of autonomous churches. Each church has a ruling bishop and a holy synod to administer its jurisdiction and to lead the Orthodox Church in the preservation and teaching of the apostolic and patristic traditions and church practices. Each bishop has a territory (see) over which he governs. 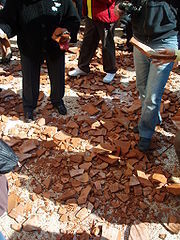 His main duty is to make sure the traditions and practices of the Orthodox Church are preserved. Bishops are equal in authority and cannot interfere in the jurisdiction of another bishop. Administratively, these bishops and their territories are organised into various autocephalous groups or synods of bishops who gather together at least twice a year to discuss the state of affairs within their respective sees. While bishops and their autocephalous synods have the ability to administer guidance in individual cases, their actions do not usually set precedents that affect the entire Eastern Orthodox Church. Bishops are almost always chosen from the monastic ranks and must remain unmarried. 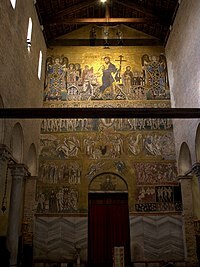 The 28th canon of the fourth ecumenical council clarified this point by stating: "For the Fathers rightly granted privileges to the throne of Old Rome because it was the royal city. And the One Hundred and Fifty most religious Bishops (i.e. 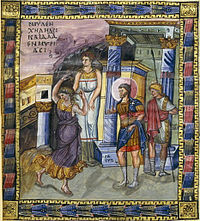 the second ecumenical council in 381) actuated by the same consideration, gave equal privileges to the most holy throne of New Rome, justly judging that the city which is honoured with the Sovereignty and the Senate, and enjoys equal privileges with the old imperial Rome, should in ecclesiastical matters also be magnified as she is." 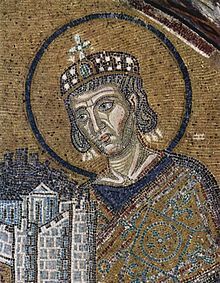 Because of the schism the Eastern Orthodox no longer recognise the primacy of the Pope of Rome. 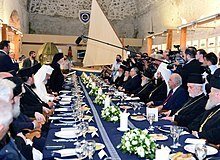 The Patriarch of Constantinople therefore, like the Pope before him, now enjoys the title of "first among equals". In understanding the Trinity as "one God in three persons", "three persons" is not to be emphasised more than "one God", and vice versa. While the three persons are distinct, they are united in one divine essence, and their oneness is expressed in community and action so completely that they cannot be considered separately. For example, their salvation of mankind is an activity engaged in common: "Christ became man by the good will of the Father and by the cooperation of the Holy Spirit. Christ sends the Holy Spirit who proceeds from the Father, and the Holy Spirit forms Christ in our hearts, and thus God the Father is glorified." Their "communion of essence" is "indivisible". Trinitarian terminology—essence, hypostasis, etc.—are used "philosophically", "to answer the ideas of the heretics", and "to place the terms where they separate error and truth." The words do what they can do, but the nature of the Trinity in its fullness is believed to remain beyond man's comprehension and expression, a holy mystery that can only be experienced. By these acts of salvation, Christ provided fallen mankind with the path to escape its fallen nature. 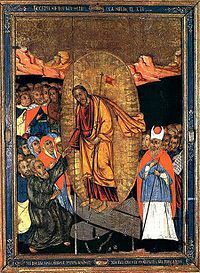 The Eastern Orthodox Church teaches that through baptism into Christ's death, and a person's death unto sin in repentance, with God's help mankind can also rise with Christ into heaven, healed of the breach of man's fallen nature and restored to God's grace. To Orthodox Christians, this process is what is meant by "salvation," which consists of the Christian life. The ultimate goal is theosis an even closer union with God and closer likeness to God than existed in the Garden of Eden. This process is called Deification or "God became man that man might become 'god'". However, it must be emphasised that Orthodox Christians do not believe that man becomes God in his essence, or a god in his own nature. More accurately, Christ's salvific work enables man in his human nature to become "partakers of the Divine nature" (2 Peter 1:4); that is to say, man is united to God in Christ. This does not "make" the person a saint; it merely recognises the fact and announces it to the rest of the church. A day is prescribed for the saint's celebration, hymns composed and icons created. Numerous saints are celebrated on each day of the year. They are venerated (shown great respect and love) but not worshiped, for worship is due God alone. In showing the saints this love and requesting their prayers, the Eastern Orthodox manifest their belief that the saints thus assist in the process of salvation for others. The Eastern Orthodox believe that Christ, from the moment of his conception, was both fully God and fully human. Mary is thus called the Theotokos or Bogoroditsa as an affirmation of the divinity of the one to whom she gave birth. It is also believed that her virginity was not compromised in conceiving God-incarnate, that she was not harmed and that she remained forever a virgin. Scriptural references to "brothers" of Christ are interpreted as kin, given that the word "brother" was used in multiple ways, as was the term "father". Due to her unique place in salvation history, Mary is honoured above all other saints and especially venerated for the great work that God accomplished through her. Children of Orthodox families are normally baptised shortly after birth. Converts to Orthodoxy are usually formally baptised into the Orthodox Church, though exceptions are sometimes made. 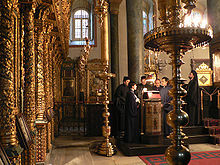 Those who have left Orthodoxy and adopted a new religion, if they return to their Orthodox roots, are usually received back into the church through the mystery of Chrismation. Properly, the mystery of baptism is administered by bishops and priests; however, in emergencies any Orthodox Christian can baptise. In such cases, should the person survive the emergency, it is likely that the person will be properly baptised by a priest at some later date. 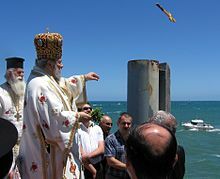 This is not considered to be a second baptism, nor is it imagined that the person is not already Orthodox, but rather it is a fulfillment of the proper form. Chrismation (sometimes called confirmation) is the mystery by which a baptised person is granted the gift of the Holy Spirit through anointing with Holy Chrism. 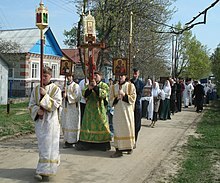 It is normally given immediately after baptism as part of the same service, but is also used to receive lapsed members of the Orthodox Church. As baptism is a person's participation in the death and resurrection of Christ, so Chrismation is a person's participation in the coming of the Holy Spirit at Pentecost. A baptised and chrismated Orthodox Christian is a full member of the church and may receive the Eucharist regardless of age. Communion is given only to baptised and chrismated Orthodox Christians who have prepared by fasting, prayer and confession. The priest will administer the gifts with a spoon, called a "cochlear", directly into the recipient's mouth from the chalice. From baptism young infants and children are carried to the chalice to receive holy communion. The church does recognise that there are rare occasions when it is better that couples do separate, but there is no official recognition of civil divorces. For the Orthodox, to say that marriage is indissoluble means that it should not be broken, the violation of such a union, perceived as holy, being an offense resulting from either adultery or the prolonged absence of one of the partners. Thus, permitting remarriage is an act of compassion of the church towards sinful man. 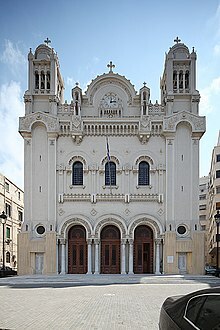 Ecclesiastically divorced Orthodox (not civilly divorced only) are usually allowed to remarry in the Orthodox Church, though there is usually imposed on them a fairly severe penance by their bishop and the services for a second marriage in this case are more penitential than joyful. Widows are permitted to remarry without repercussion and their second marriage is considered just as valid as the first. One exception to this rule is the clergy and their wives. Should a married priest die, it is normal that his wife will retire to a monastery once their children are out of the house. Widowed priests are not allowed to remarry (no priest may be married after his ordination) and also frequently end up in monasteries. 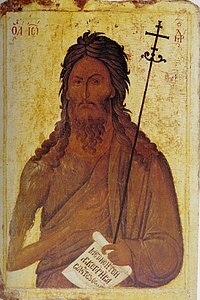 After the Christianization of Bulgaria in 864, the disciples of saints Cyril and Methodius in Bulgaria, the most important being Saint Clement of Ohrid and Saint Naum of Preslav, were of great importance to the Orthodox faith in the First Bulgarian Empire. In a short time they managed to prepare and instruct the future Bulgarian clergy into the biblical texts and in AD 870 the Fourth Council of Constantinople granted the Bulgarians the right to have the oldest organised autocephalous Slavic Orthodox Church that little later, from autonomous Bulgarian archbishopric, became Patriarchate. The success of the conversion of the Bulgarians facilitated the conversion of East Slavic peoples, most notably the Rus', predecessors of Belarusians, Russians, and Ukrainians. 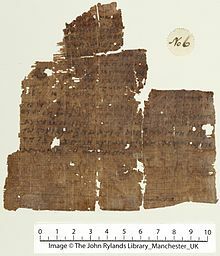 Major event is the developement of the Cyrillic script in Bulgaria at the Preslav Literary School in the 9th century. 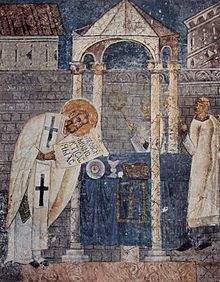 The Cyrillic script and the liturgy in Old Church Slavonic, also called Old Bulgarian, were declared official in Bulgaria in 893. 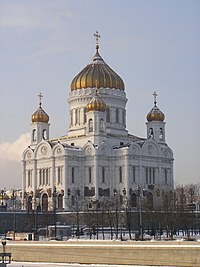 After the October revolution of 1917, part of the clergy of the Russian Church escaped the Bolshevik persecutions by fleeing abroad, where they founded an independent church in exile, reunified with the Russian one in 2007. The Orthodox Church clergy in Russia were seen as sympathetic with the cause of the White Army in the Civil War after the Revolution, and occasionally collaborated with it; Patriarch Tikhon's declared position was vehemently anti-Bolshevik in 1918. This may have further strengthened the Bolshevik animus against the church. The Soviet government confiscated church property, ridiculed religion, harassed believers, and propagated atheism in schools. Actions toward particular religions, however, were determined by state interests, and most organised religions were never outlawed. Some actions against Orthodox priests and believers along with execution included torture, being sent to prison camps, labour camps or mental hospitals. In the first five years after the Bolshevik revolution, 28 bishops and 1,200 priests were executed. Albania was the only state to have declared itself officially fully atheist. In some other Communist states such as Romania, the Romanian Orthodox Church as an organization enjoyed relative freedom and even prospered, albeit under strict secret police control. 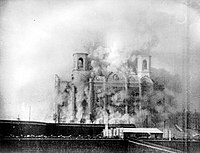 That, however, did not rule out demolishing churches and monasteries as part of broader systematization (urban planning), and state persecution of individual believers. As an example of the latter, Romania stands out as a country which ran a specialised institution where many Orthodox (along with people of other faiths) were subjected to psychological punishment or torture and mind control experimentation in order to force them give up their religious convictions. However, this was only supported by one faction within the regime, and lasted only three years. The Communist authorities closed down the prison in 1952, and punished many of those responsible for abuses (twenty of them were sentenced to death). In that regard, the differences between the Catholic and Eastern Orthodox communions have not been improved in any relevant way. Dogmatic and liturgical polarities have been significant, even and especially in recent times. 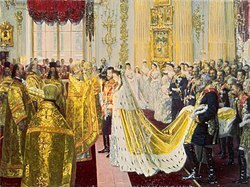 A pertinent point of contention between the monarchically papal, administratively centralised Catholic Church and the decentralised confederation of Orthodox churches is the theological significance of the Virgin Mary. Even during a visit by Pope Francis to Georgia in October 2016, the leader of the Catholics was snubbed by most Orthodox Christians when he was holding mass in front of the practically empty Mikheil Meskhi Stadium in Tbilisi. Self-governing Ukrainian Orthodox Church (Moscow Patriarchate) (Metropolitan of Kiev and all Ukraine) – Recognised by the Russian Church, no longer recognised by the Ecumenical Patriarchate as of October 2018. Orthodox Church of Ukraine (Metropolitan of Kyiv and All Ukraine) – Recognised only by the Ecumenical Patriarchate as of January 2019, opposed by the Russian, Serbian, and Polish Orthodox Churches. ^ Dvornik, Francis (1956). The Slavs: Their Early History and Civilization. Boston: American Academy of Arts and Sciences. p. 179. The Psalter and the Book of Prophets were adapted or "modernised" with special regard to their use in Bulgarian churches, and it was in this school that glagolitic writing was replaced by the so-called Cyrillic writing, which was more akin to the Greek uncial, simplified matters considerably and is still used by the Orthodox Slavs.